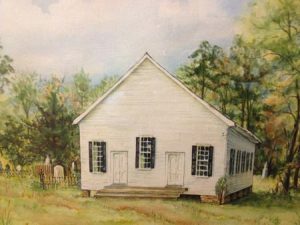 The Edgefield County Historical Society has announced their Spring Meeting, to be on Palm Sunday, April 13, at 3:00 p.m. at Historic Horn’s Creek Church on Old Stage Road. Their notice says: “At this meeting, the churches in Edgefield County will come together for a grand Palm Sunday procession and ceremony to bless this historic church as we begin it restoration as a place of worship and a museum of the early religious history of Edgefield County.” A “summer supper” and refreshments will follow. There will be an opportunity also to wander through the cemetery and to hear stories and information from docents about the families and persons buried there. The Society is soliciting donations to help with this project. Horn’s Creek Church and Cemetery restoration is one of the 2014 objectives of the Society. They have secured a mortgage loan for a caretaker’s cabin that is proposed to be built on the property. A new Web site is being developed and hopefully completed this year. Other subjects of interest: the Village Blacksmith, Jamie von Stevens, has the shop open generally on Thursday and Friday; Ike Carpenter continues to carve his specialties and is popular with larger group tours; the Edgefield History Class, recently reported on in the Aiken Standard, is writing a book on The American Revolution in Edgefield – from Ninety-Six to Augusta; “The Story of the Pine House,” recently published by Historian Bettis Rainsford at the time of the marriage of his son, is available to those interested in purchasing it. The Edgefield County Historical Society continues to be a strong arm of outreach to give Edgefield “ex-pats,” who have moved to other areas, a way to keep investing in their home communities, as well as to strengthen the voices from the past with publications and ceremonies of celebration for all to take part in.